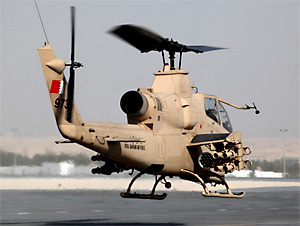 The AH-1E ECAS (Enhanced Cobra Armament System) uses the improved M79E1 chin turret, housing the three-barreled M197 20mm cannon found on other Cobras. ECAS Cobras feature greater selective fire options when loaded with mixed-use rockets (i.e. high explosive, submunition, flechette, smoke, chaff, etc. ), as well as automatic weapons management systems designed to compensate for wind, weapon recoil and other forces. It was also the first US Army Cobra to use the composite Kaman K747 rotor blade. 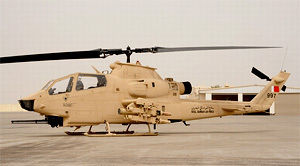 Resources related to the AH-1E ECAS, provided by the Vertical Flight Society. Resources related to the AH-1E ECAS, provided by public sources across the internet.